With its big egos, huge wallets and itty-bitty outfits, satirizing the art world is not exactly hard work. But the Frieze Art Fair, which opened here last night, isn’t just another pretty space. Just in case you missed the irony of holding a festival devoted to the most conspicuous form of conspicuous consumption while the world wobbles on the brink of economic catastrophe, the organizers of the Frieze Art Fair, which opened last night in Regent’s Park, have commissioned a collaboration between the German artist Christian Jankowski and the Italian boatyard CRN for a 65-meter superyacht. Buy it as a boat, and built to your own specifications it will cost you €65 million. Buy with added “art” status (but no other special features beyond a handsome certificate from Jankowski designating the yacht as floating “sculpture”), and the price jumps to €75 million. With its big egos, huge wallets, and itty-bitty outfits, satirizing the art world is not exactly hard work. Personally, I have a soft spot for the Frieze, and not just because a couple of years ago the organizers paid me to give a talk on the WPA arts project, which gave a paycheck—and the promise of a future—to some of America’s greatest artists and writers during our last Depression. I also liked the blend of naked hustle and “Hey, kids, let’s put on a show” spirit shown by Frieze founders Amanda Sharp and Matthew Slotover, who managed to get the notoriously stuffy Royal Parks Agency to let them put up a tent in 2003, and through salesmanship and sheer willpower have turned the thing into an international phenomenon (coming to Randall’s Island in May). I took our daughter, who turned 16 yesterday, and we had a grand time gawking at the de Kooning and Chuck Close and Claes Oldenburgs visiting from New York, and at the gorgeous Grayson Perry vases. The point of the fair is commerce, not culture, and for every museum-certified great artist there are a hundred relative unknowns. 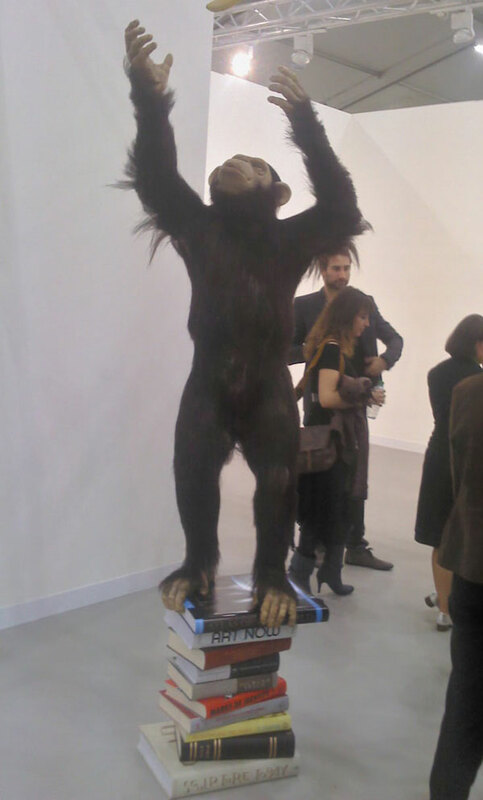 Some of them are wonderfully silly, like Michael Elmgreen and Ingar Dragset’s life-size—and lifelike—statue of a chimpanzee, standing on a pile of weighty books trying to reach a banana. And some are wonderfully charming, like Pawel Althamer’s pensive metal and goat-hair Billy Goat 2011. But the piece that Zoe and I both particularly loved, and which I wanted to let Nation readers know about, was in one of the more out-of-the-way stalls. Khalil Rabah’s 50,320 thousands names is an oil painting made of five rectangular canvas panels, each of which depicts what appears to be a set of hanging files. The serene colors and the way the paper and wood lean against each other, and the grid made by the piles of books and paper all serve to draw you in; the effect is both very beautiful and also quite haunting. What are these files? And then, after searching out the title card, whose are these names? And so I learned that Khalil Rabah lives in Ramallah, and that the names in his painting are of Palestinians who live in buildings listed in the Registry of Historic Buildings in Palestine. The painting is part of a larger project called The Palestinian Museum of Natural History and Humankind. With any luck that, too, will make its way to New York this spring.